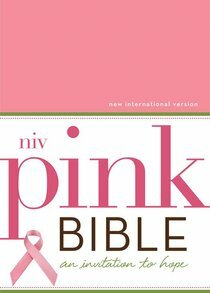 About "The NIV Pink Bible (1984)"
The NIV Pink Bible eBook: An Invitation to Hope is designed to help women who have been impacted by breast cancer to discover timeless and encouraging words of hope through highlighted verses of hope and encouragement as well as reflections and stories meant to inspire and uplift. Help those who have been impacted by breast cancer discover timeless and encouraging words of 'hope' direct from Scripture and through additional content during their fight against cancer. "This Bible is for women for all ages who have been affected by the disease of breast cancer. Whether you are a survivor or a co-survivor, the NIV Pink Bible brings you timeless words of comfort, hope, and encouragement. Designed for easy navigation, passages on the topic of hope are highlighted for quick access. Additional content with reflections and stories offer further encouragement throughout the Bible. NIV 2011. The New International Version (NIV) translation of the Bible is the world's most popular modern-English Bible?easy to understand, yet rich with the detail found in the original languages."